Saturday, 8 December 2018, 9:02a.m. This nurse suffered second-degree burns when a patient poured boiling water on her. 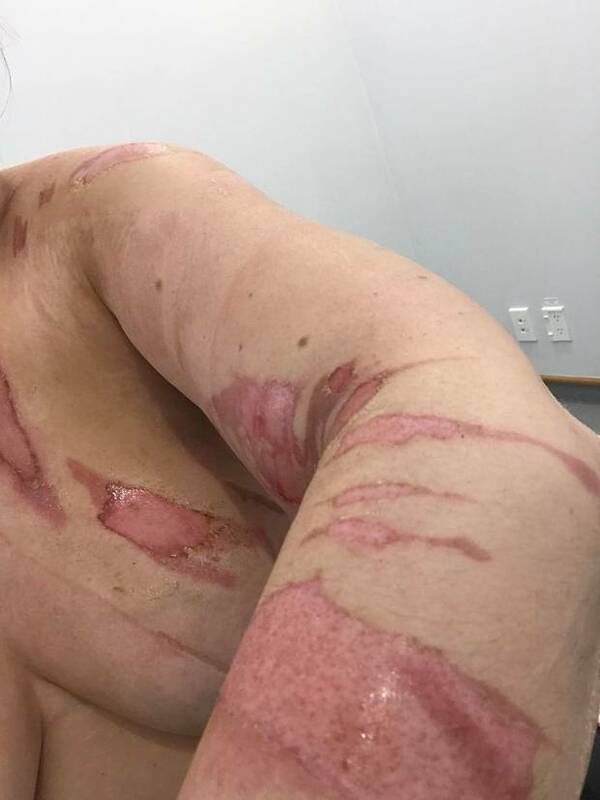 As scalding hot water seared through her skin, a nurse who had boiling water thrown on her was forced to wait as a patient blocked the only way out. Now she is calling for an independent investigation on the safety of the Hillmorton Hospital facilities. The nurse, who works at the adult mental health facility in Christchurch, suffered second-degree burns to the upper left side of her chest and arm when a female patient poured boiling water on to her while she was in a nurses' station room. Charges are unlikely to be laid and the patient remains at Hillmorton. The incident happened about two weeks ago at the hospital; which has been plagued with several incidents involving nurses being injured. Last Sunday, another nurse was stabbed with what is understood to have been surgical scissors. Yesterday, police were called out to the unit after a staff member was assaulted and needed hospital treatment. Police said the person was injured after being punched. Speaking to the Weekend Herald, the burned nurse described the terrifying wait she had to endure immediately after the incident. "I was delayed in getting treatment for my burns because there is only one door in the nurses' station," she said. "After the patient had thrown the boiling water on me, she blocked the doorway. "There was no way for me to leave to get help or first aid until the nursing staff came and moved the patient." The lack of exits has been an ongoing concern for nurses, she said, and they had requested that another door be created in the nurses' station. They were told it would be too expensive to install one, she said. "A year ago, a patient pushed a couch in front of the door, blocking it, then set it on fire. "The nurse had no escape. She wasn't hurt because our nursing team are fantastic. We have to be. Canterbury DHB chief executive David Meates said he was "shocked to see the extent of the injuries" caused by the boiling water and assured the Weekend Herald a review was being carried out and changes had already been made. "A re-design of the High Care Area office area to allow emergency egress has been identified as urgently required. Options for a practical solution are yet to be scoped, so we don't yet know how feasible it is to add an extra door. The issue is not one of cost but whether it can be done from a practical point of view," he said. The nurse said she was the second person to suffer burns from having boiling water thrown at them by a patient. As a result of the first incident, the temperature on a hot water zip machine was changed in that particular ward - but not in the others, the nurse said. "They knew there was a serious risk and hazard to both staff and patients but failed to correct it. Very few other hospitals allow zips on the wards for this reason." Since the attack, the zip machines had been disabled, Meates said. Speaking up about patient-on-nurse violence was not about making it out to be a divisive patients versus nurses issue, she said. Instead, nurses wanted the public to know what was happening in the mental health system and for those in management positions to hear their calls for better safety measures in wards. She said the nurses dealt with violence on a daily basis as well as occasionally with patients who had bought drugs from other patients. They also had to deal with having to face a patient who had earlier assaulted them, been charged by police, then sent back to Hillmorton. In last week's stabbing case, the 42-year-old charged with intent to injure has since been remanded back to the facility. "I believe it is unacceptable to use hospitals as a place to leave remand prisoners," she said. Meates said high demand made it difficult to place patients back in different areas after an assault. "Wherever possible a patient will be brought back to a different part of the unit, or a different service if appropriate, or we can try to find an alternative place for the staff member to work, but this isn't always possible," he said. Among her recommendations were to bring in dedicated security staff on wards. "It is very hard to build a therapeutic and healing relationship with patients when days before you may have had to restrain them due to a drug-induced psychotic event where they are hurting themselves and other patients. "Patient-on-patient violence is an almost daily occurrence on the wards and sometimes nurses feel more like prison guards than the caring and concerned nurses we are." She said that in Australia, security guards were posted on wards so that dangerous behaviour was dealt with swiftly and nurses could focus on doing their job. "The mental health system and current facilities and policies are hurting everyone involved and now we need to come together to fight for change." As of yesterday, two extra secuity staff would be on duty in the acute inpatient unit around the clock, Meates said. The attacks come as the Report of the Government Inquiry to Mental Health and Addictionwas released this week. One of its recommendations was the need to implement a national suicide prevention strategy. Canterbury District Health Board chief David Meates met with mental health nurses at Hillmorton to discuss safety concerns. In a statement he said he was extremely concerned about the latest assaults on staff and that a review will be carried out to understand the circumstances and also what could be done to reduce the chance of a recurrence.